White Chocolate Irish Cream Cupcakes are moist, tender and delicious. They are the perfect recipe for a special occasion, or anytime. These delicious cupcakes was first published on 3/10/16 and has been updated to improve the reader experience. Ahhh we are finally getting close to St. Patrick’s Day. As I’ve said before, Americans are always looking for a reason to party. To get our party started, I came up with White Chocolate Irish Cream cupcakes with White Chocolate Irish Cream frosting. 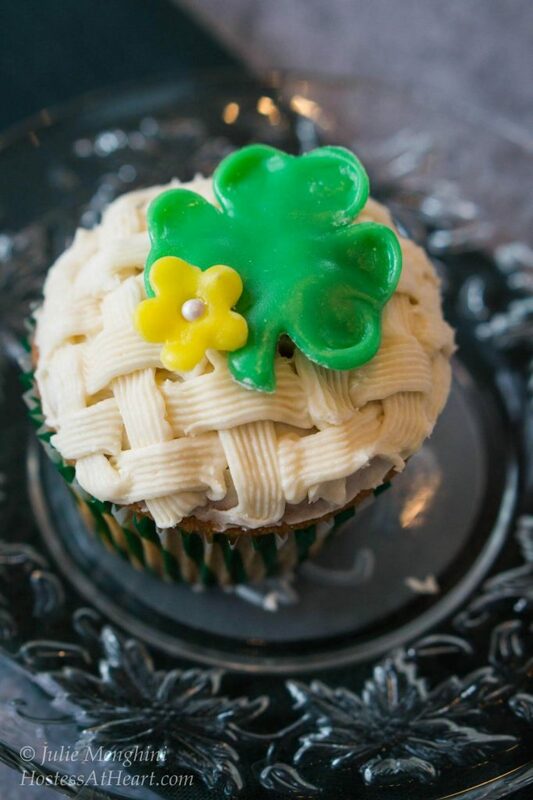 I think there was a little mischievous little leprechaun in my kitchen when I was working on developing this recipe. It took me four attempts to get a cupcake that was tender and delicious. My cupcakes had to be moist and have a light crumb, and not tough or dense. Also, I wanted these cupcakes to be easy for you to put together. After all, there are a lot of St. Patrick’s Day celebrations to attend. In addition to St. Patrick’s Day, Easter is close behind, and so is a celebration for my mother in law’s 90th birthday. She happens to be full blooded Irish, and St. Patrick’s Day is like Christmas to her. These cupcakes are pulling triple duty! Do you remember my modeling chocolate post? I used dark chocolate modeling chocolate for the Black Russian cake that I made. That was so much fun, that I couldn’t wait to try white modeling chocolate. 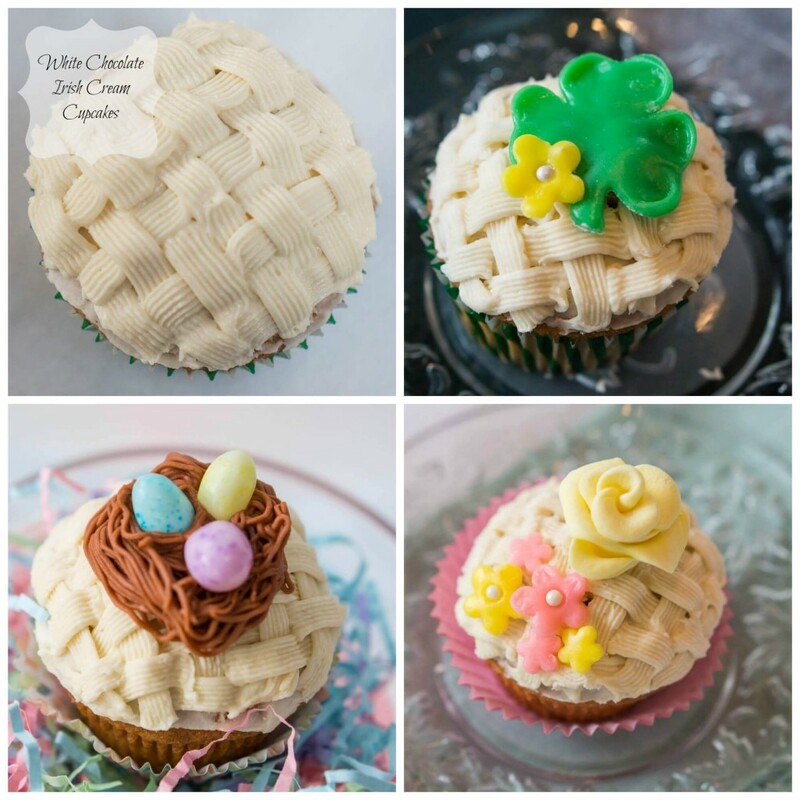 Speaking of fun, here is my video on how to make the basket weave on top of these cupcakes. 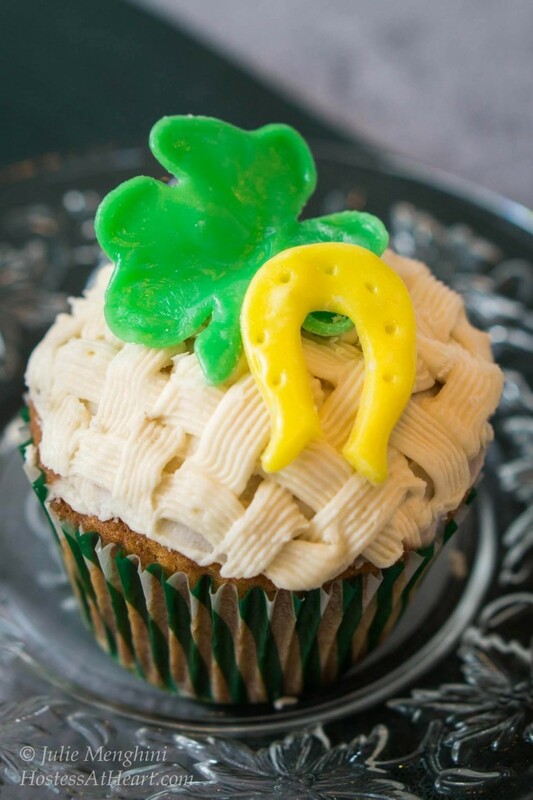 If you like this Baileys Irish Cream cupcake recipe I think you’ll like these St. Patrick’s Day desserts too! Cupcake pans – They’re pretty self-explanatory but I make egg cups or mini meatloaves in these pans. The sizes allow me to freeze my recipes. Decorating Tips – This set of two is all you will need for this cupcake but if you’re just getting started this is a nice beginner kit. Scoops – Wonder how those cookies are the same size? Scoops and I use them for my cupcakes too! White Chocolate Irish Cream Cupcakes are moist, tender and delicious. They make the perfect dessert for holidays, a special occasion, or anytime. Preheat oven to 350 degrees F. Line 2 cupcake pans with cupcake papers or spray with non-stick cooking spray. Combine all ingredients in the bowl of an electric stand mixer. Blend until combined. Bake 19-23 minutes, turning pans halfway through. Cool completely on a cooling rack. Put the white chocolate chips in a glass measuring cup or glass bowl, and add heavy cream. Microwave at 50% power for 30-second intervals, stirring after each cycle. Stir until smooth. In the bowl of an electric stand mixer, fitted with the paddle attachment, combine powdered sugar, butter, Irish Cream liquor, and melted chocolate. Mix to combine. Add additional Irish Cream liquor or cream until the frosting is the right consistency for spreading. Are you Irish all the time or just on St. Patricks Day? What will you be doing to celebrate? Leave me a comment and I’d love a 5-star rating! So mine didn’t turn out looking nearly as pretty as yours, but they tasted AMAZING!!!! Thank you, Jessica! Did you do the basket weave technique? It took me a little while too. Thanks for stopping by. White chocolate and baileys are a glorious combination. These lovely cupcakes are fantastic – thanks for the recipe Julie. Thank you, Jane! We really enjoy these cupcakes! Thank you Mar! I would too if I was you. These are so pretty! With those ingredients they must taste yummy, too. I love how you used the same basic basket weave for the frosting, but decorated the top differently for each occasion. Very clever! They all look beautiful. Thank you Shari! Now I only have to make 60 of them for my Mother-in-laws birthday! Thank you Dini! Now I only have to make 60 more for my mother-in-law’s birthday! These cupcakes are beautiful–too pretty to eat, but I would definitely not let that stop me! 🙂 You did a wonderful job decorating these! This is making me so hungry!! Thank you Isabel! You’re so darned sweet. Such lovely decorated cupcakes! What could make St. Patrick’s day more memorable? Thank you! I got the thumbs up from my Irish mother-in-law too! Julie you are very talented and those cupcakes are super cute… I am pretty sure your mother in law will be very happy for what you have done for her and St. Patrick’s day! Thank you! I just showed her the picture and her Irish heart loved them. Now I have 60 of them to make! I’m so envious of your decorating abilities, Julie. These are a work of art… they sound yummilicious, as well! Thank you! They look a lot more impressive than they really are. I’m working on a how to post so you will see how easy it really is. Thank you so much Anna! They’re a lot of fun to make too. Thank you Jhuls! I appreciate your co-hosting FF this weekend and hope you have a great time! This recipe is a keeper for sure – Irish cream added to any dessert has to be good! Thank you Judi! I think the frosting was delicious, and even though the cupcake wasn’t overly evident, I think it helped the moisture. These look and sound super yummy! And I’m in awe of your piping skills, so good! Thank you Michelle. LOL! I was thinking my piping was a bit sloppy on these. Julie, you have a true talent! Awe thank you Debbie! So do YOU! Your cupcakes are a work of art! What pretty little cupcakes! Love the lattice look and dainty details. So wonderful and beautiful! I just loved looking at your works of art! Thank you so much Susan! I really appreciate your support. The baking goddess is at it again! These gorgeous cupcakes are simply adorable Julie. I can only imagine the work and patience that went into it. I’ll bet your ma in law will absolutely love these in celebration of her 90th. Well done, Can’t wait to see your modeling techniques for these cuties. Thank you so much Loretta! She will love anything that I do but I hope I can help make her day special. I just doing this kind of detailed stuff. I’m in my element when I’m doing detailed work like this. I think you will be surprised how easy it really is. These are so beyond cute and delicious too, no doubt. What beautiful work, Julie! Thank you Josette! I just have so much fun tinkering with this kind of thing. Your artistry shines through in everything you make!!! Thank you Elaine! I just have so much fun doing it. Beautifullllll. Those look awesome. I would really like to dig into one right now. Thanks Quinn! You know I’d share! Thank you Lina! That is praise in the highest form coming from you! I’d love to. Send me the info. I followed the last challenge, and I was glad that I wasn’t the judge! There were so many wonderful entries! Thanks Ana! It’s just fun for me.